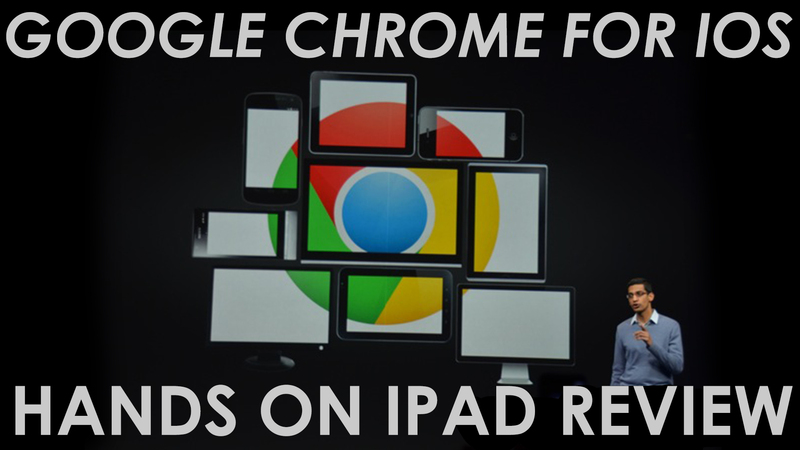 Today Google announced at its I/O conference that they are coming out with Google Chrome for iOS. We all love Google Chrome and now it is available on your iPhone or iPad with dedicated versions for both. We take a look at the iPad version today and take an in-depth look at the of the features. Just like the Google Chrome web browser you can sync your tabs from desktop to device so you can keep you place easily while working on different computers or even different devices. Just like the desktop version of Google Chrome there is a unified search box for searching and using it to enter URLs. This is great for the power users and hobbyists alike and is going to be bringing some major competition to Apple’s Safari browser. Because Google Chrome is synced with your Google Account that means that it can bring over your history and bookmarks letting you work seamlessly throughout Google Chrome. If you do use Google Chrome to also store your passwords, you’re in luck. When you have Google Chrome signed in under your Google Account it can automatically sign you in with the touch of a button. Just like on the desktop version you have tabs that are organized neatly for you to scroll through. If you find yourself in situations sometimes where you in a little privacy while browsing the web, Google Chrome for iOS has built-in Incognito functions to browse privately. Overall we’re very impressed with the iPad version of Google Chrome. It brings a lot to the table and is surely going to give Safari a run for its money in the mobile iOS community.